Celebrate all the great cleaners you know by nominating them for Pattersons Cleaner Of The Year competition 2018. Clean up like cleaning sensation Mrs Hinch using all of her favourite brand cleaning supplies. Bulk buy soda crystals like Mrs Hinch with next day delivery. The grateful students wanted to thank Hermon, their rather surprised and overwhelmed library cleaner for his “positive energy” and for brightening their days whilst of course continually keeping their library a clean and positive place to work. The heartwarming story outlined the importance cleaners have on our day-to-day lives and how we would like to give all the amazing cleaners and cleaning teams out there the recognition they deserve – not just for their cleaning tasks, but for their hard work, team work, high spirits and contribution to making everyone days great! So with that in mind… do you know a cleaner that you’d like to thank and recognise for their hard work? 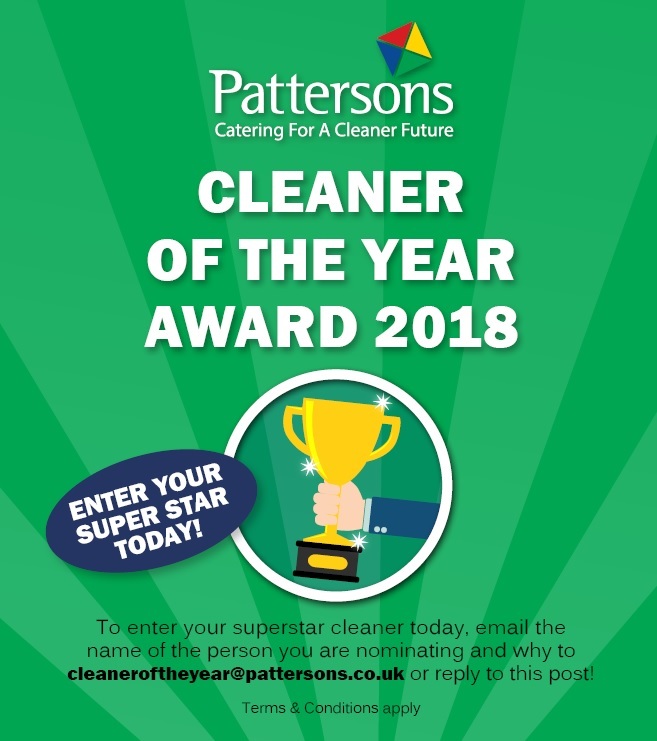 Why not nominate them for PATTERSONS CLEANER OF THE YEAR by emailing cleaneroftheyear@pattersons.co.uk or Tweeting @PattersonsWeb stating who you are nominating and why you think they deserve this award! Nominations close 30th November 2018. Pattersons Cleaning Supplies are proud of the cleaners and cleaning teams we work with, whether that’s in a catering establishment, school, University or shopping centre. We think it’s time these fantastic cleaners get the recognition they very much deserve for their hard work. Entries for the Pattersons Cleaning Of The Year Award 2018 have been open for a couple of months and already we have had some fantastic nominations – in fact, it’ll be super hard to choose a winner. Here at Pattersons Cleaning Supplies we stock a wide range of professional cleaning solutions, cleaning chemicals and cleaning equipment ideal for school cleaning, University cleaning, restaurant cleaning and care home cleaning. Choose from leading brands including our Jangro range, Katrin range, Karcher range and loads more! Based in the South West, we offer free site surveys to ensure you comply with COSHH and with almost 130 years experience in the trade, our trusted cleaning experts can be relied upon to help support and guide you in choosing the right cleaning supplies for your school, college, University, restaurant, pub, care home and more! Use disinfectant spray and a cleaning pad to clean away the dirt from your sink before using CIF stainless steel cleaner to make your sink shine. Spray your chosen degreaser on the affected area then use an electric toothbrush to wipe away the dirt. Use a mixture of washing up liquid, disinfectant and a cleaning pad/cloth.